So, no chimney in the room where you want your stove? Why not create one? It's easy - clip-together parts from top to bottom. 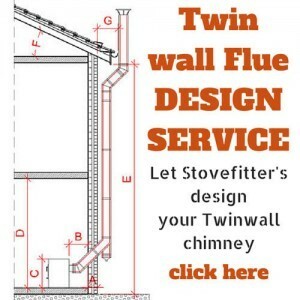 Find out how to install your twin wall flue chimney here. Take advantage of a FREE design service and telephone assistance. 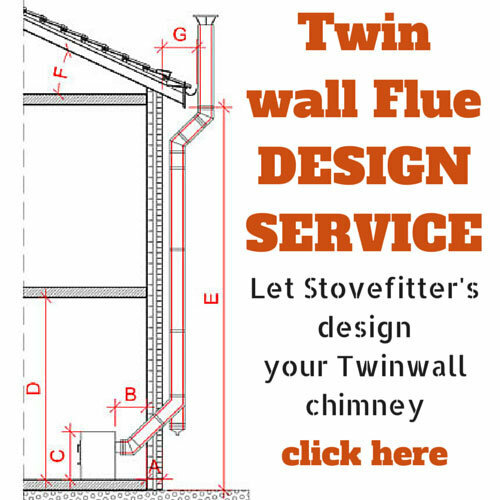 Twin wall flue is also known as DW (double wall) or HT (High Temperature) flue. 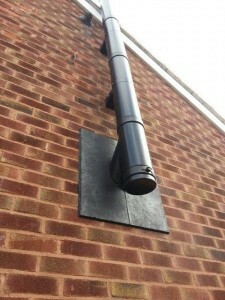 Twin wall flue pipe cannot be cut to length by you to make it fit. 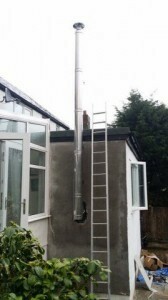 So one needs to plan carefully when installing a twin wall flue chimney. 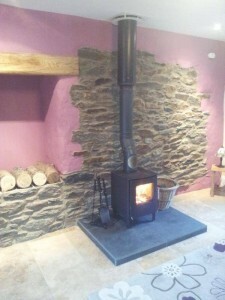 TOP TIP>>> Not bought a stove yet and running the new chimney outside the building? Consider one with the potential to add a direct air supply (sometimes called “external air supply”). Why? Modern stoves have less hot air leaving up the chimney than older stove-models and however well a modern twin wall system is insulated these external chimneys are invariably colder than internal designs. Usually there is no problem at all but if you ever have a problem with the draw of your stove (poor performance or smoke puffing from stove into room) it is usually because something is causing air to be sucked from the room where the stove is situated causing a vacuum (e.g. another open fireplace in adjoining room or even a tall staircase and trickle vents upstairs) and this is overpowering the draw of the new stove and chimney. Should this fairly rare situation ever arise it is usually curable by connecting the stove’s air intake directly to outside. I have known installers have to remove a stove to change for one with external air capability – how they wish they had chosen one in advance! Installing an external air connection as a matter of course is not a bad idea as one never knows if this problem will affect you or not. SIA Ecodesign stoves: are they any good? 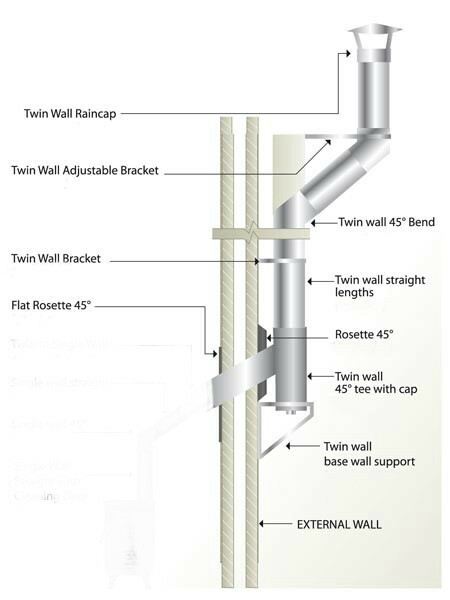 Twin wall flue pipe is a “clip-together” chimney system that can be used to safely take the combustion gases from a wood burning stove and outside to the atmosphere. Some excellent documents by the British Chimney Manufacturer’s Association on this page (really worth a look as easy to read with lots of diagrams) here. Want a fast and excellent method for building a false chimney breast? Use Skamol: https://www.opiesuk.co.uk/skamo-enclosure. 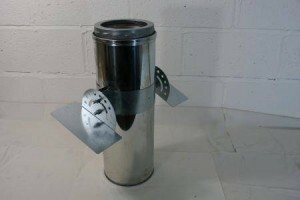 Twin wall flue is a metal tube (flue) insulated with approx. an inch of insulation (two layers of stainless steel with insulation between). The insulation is necessary to keep the gases hot. Were you to use non-insulated flue pipe for the whole of your chimney, then the gases would likely cool too much and start to slow rather than rise with this causing the smoke underneath to “dam”. This might cause the smoke below to exit out of the vents in your stove instead of the top of your chimney. Cooling gases also form condensation which forms on the inner walls of the flue and runs down into the stove (mixed with soot it is a disgusting brown liquid). 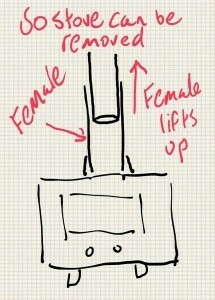 Note the difference between a chimney and a flue: if the chimney is a polo mint then the flue is the hole. 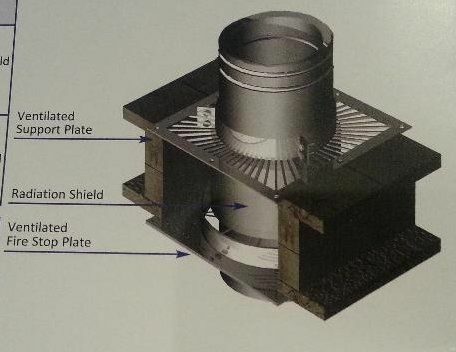 With regard to diameter, twin wall with an inner diameter of 5″ has an outer diameter of 7″ whilst twin wall with an inner diameter of 6″ has an outer diameter of 8″. You will most likely be fitting flue that has an inner diameter of 5″ or 6″ but check what diameter flue your stove requires. 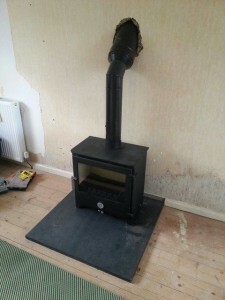 You can fit 5″ if the stove is DEFRA approved and the manufacturer does not state 6″ as a minimum (see articles on DEFRA stoves). The narrower diameter of 5″ can look less obtrusive if taking it all the way down to the stove and can prove desirable if combustible materials ensure the route is difficult (e.g. if the gaps between joists are too close for a 6″ flue to pass through with the required safety air gap then 5″ may be the answer). 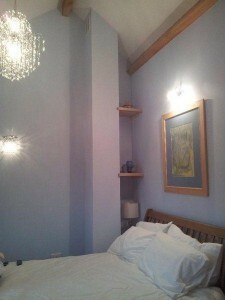 The wider diameter pipe exiting the room in this picture is black twin wall flue. Underneath this is steel “vitreous” stove pipe. Both types of pipe are 6″ (inner diameter) but the black twin wall flue is 8″ external diameter as it is insulated. The offset from the stove is present to provide the stove with an air gap at the back of the stove. You can run twin wall all the way to the stove if you wish (can look “fat” on small stoves). 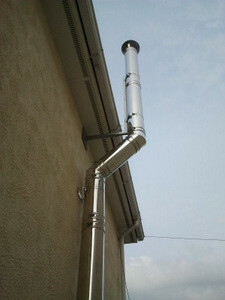 Twin wall flue is generally available in silver (reflective chrome-like) and black (satin/matt finish). The black is a little more expensive. 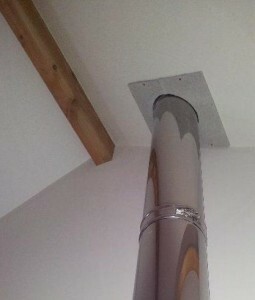 Quality twin wall flue is expensive at £75+ a metre (but cheap when compared to building a new chimney). 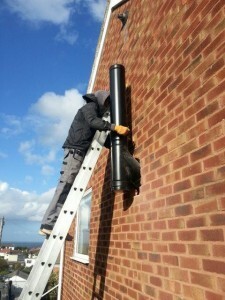 Twin wall flue can travel internally within a building or externally on an outside wall. 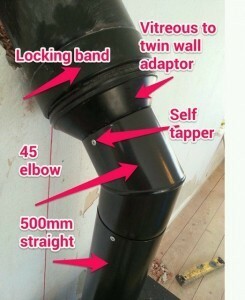 Twin wall flue pipe is not difficult to fit (it all clips together); you just have to know your Building Regulations. You must notify Building Control prior to installing any chimney (unless you are approved to self certify, as are Hetas engineers). 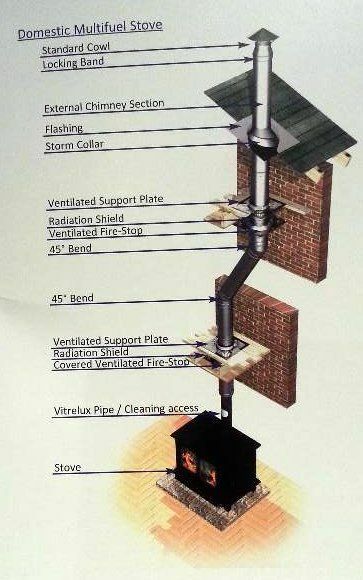 Note: steel vitreous stove pipe (non-insulated) MUST NOT be used to go through a wall or ceiling, except directly into a chimney. If you need to exit the room, whether out through a wall or through a ceiling then you must use twin wall flue pipe and then stay with twin wall flue pipe to the cowl (unless going into a chimney higher up). Twin wall flue pipe should always be kept a minimum of Xcm from any combustible materials. “X” is usually 5, 6 or 7cm but can be more (check with supplier). Fusion twin wall, for example, should be kept 5cm from combustible materials and Duraflue twin wall 7cm. A chimney cannot have more than four bends and no bend can be more than 45 degrees (except if you use a 90 degree “T” off the rear of the stove). If you are are going out through a wall then you will be using two 45 degree bends straight away and have two left if you need them. Use two more to clear the eaves and that’s your maximum! Note that coming off the back of the stove with a T is classed as, for Building Regulation purposes, equivalent to two bends even though it is actually one 90 degree bend. With the exception of the T off the back of a stove the maximum angle of bend is 45 degrees. Bends of 15 and 30 degrees are also available. DON’T GET CAUGHT OUT BY: ceilings are almost always classed as combustible and any steel vitreous pipe must be kept well away (425mm or 17″ covers all situations likely to be encountered e.g. with 5″ and 6″ diameter steel vitreous pipe). The actual rule is 3x the diameter of the offending pipe. The top of the chimney should be a recommended minimum 4.5m above the top of the stove according to Building regs – but as long as the chimney works properly there is no minimum. With modern twin wall flue being so well insulated a minimum 3.5m is generally accepted as being tall enough. 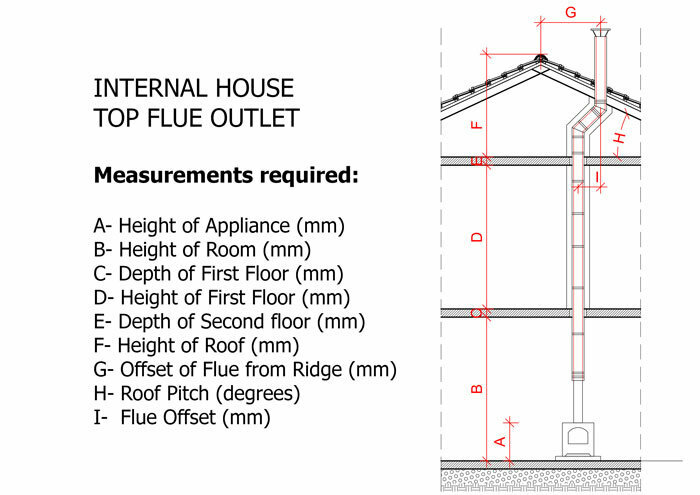 A chimney should also pass the 2.3m rule or/and be 60cm higher than the ridge of your building. Read “Regulations For the Chimney“. 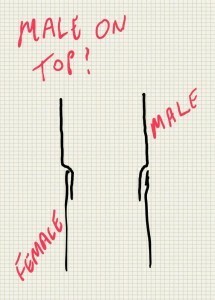 In the UK flues are always connected with the male pointing down (is the opposite in Europe). This is so that condensation/thin tar etc. running down the tubes cannot escape. To ensure you are installing correctly take your cowl and look at it: obviously the joint points down and goes into the piece below it – every joint will work the same. You cannot fit a cowl upside down so the jointing process becomes apparent when you examine this particular item. The above diagram is Scenario 2 at Stove Fitter’s warehouse. 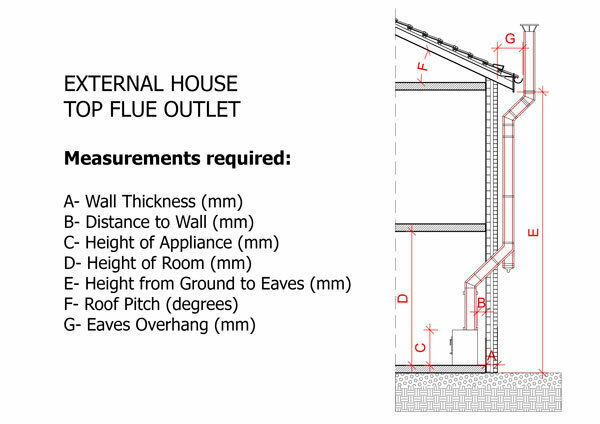 The measurements detailed are those required for this installation to be drawn on large scale graph paper. This is the desired end result (or similar). Note that many people prefer black twin wall for everything inside the property (on a black stove). 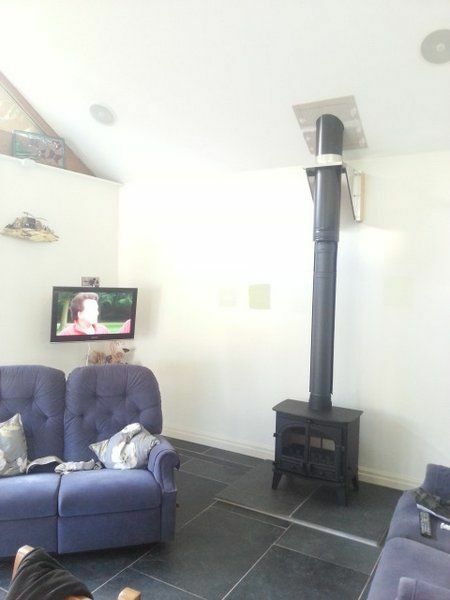 Coloured stoves tend to look better with coloured vitreous pipe or silver twin wall. In the instance above the householder wanted silver twin wall “in the room and all the way to the cowl”. You can mix the two (e.g. black twin wall inside with silver outside). 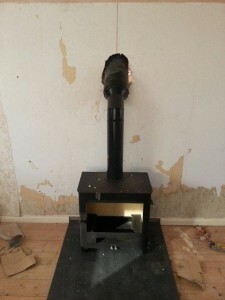 My initial plan with this article was to treat the actual stove fit separately to the chimney install, in the stove fit section of this site, and just detail a twin wall chimney install here. But you really have to have the stove-fit in mind at all times when “building the chimney” and it is difficult to separate the two processes. The most common methods of fitting a twin wall system involves using vitreous steel pipe for the first section “off the stove” with a change to twin wall just before exiting the room (via the ceiling or wall). It is not the only way though – one can take the twin wall all the way to the stove if one wishes (twin wall all the way to the stove can look a little “fat” depending on stove size, this due to the extra diameter). Now let’s get something out of the way early on: it is good practice that you be able to remove the stove without dismantling the chimney. Why? Well you might have a warranty issue with the stove for example and need to swap it over. Or you might choose to buy a new stove. But then again hardly anybody worries about this and stoves are generally installed “for good”. I used to take “removable” as meaning that the bottom length of vitreous pipe should be adjustable and always used to make my vertical steel-vitreous an adjustable section. The problem with this is that you then get a join in the main vitreous that some customers do not like to see. But having an adjustable section is great – the stove can be added/removed easily at will (also helps when you realise that you forgot to add the cosmetic rosette during installation). If you do not add the adjustable section and just keep stacking each item on top of another then it is usually not possible to remove the stove at all because the first section of pipe drops an inch into the stove collar and each pipe above then drops an inch or so into the one below. When you attempt to lift the bottom section of vitreous up out of the stove collar (to remove the stove) you realise that nothing moves a single mm. Am I the only one in the world bothering? One fitter said to me “if the legs can come off the stove then one can remove a stove by unbolting the legs and dropping the stove so that gets around it”. Another fitter says “just cut through the vitreous and remove the stove and the chimney ” (re-fitting would then require an adjustable). So I leave it up to you to decide and maybe I am overthinking this one. Update: The last two twin wall jobs I have fitted I have not used an adjustable vitreous pipe.. It is good practice (but not legally required), if possible, that the first length of pipe exiting the stove does not have any bends for the first 600mm. Theoretically this assists flue draft. This does mean that our hole in our wall is quite high but luckily it usually looks good at this height (in art there is something called the rule of thirds which suggests that the flue should exit a third from the floor or one third from the ceiling). If you do come off of the back of the stove (on a 45 degree pipe to outside) then less of your pipe is seen in the room. I prefer coming off the top as the draft is somewhat better but both can work fine (off the back can mean the stove draw is less and the stove is more difficult to light without getting a little smoke in the face during lighting). To create our hole we first have to work out where the hole needs to be. Back to the “off the top” method the best approach is to assemble your stove on its hearth with a length of 500mm pipe on top and a 45 degree elbow on top of that (the two combined provide your 600mm height). 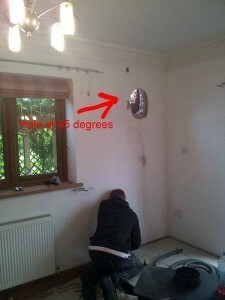 From this mockup we can project the route of the 45 degree flue and mark on the wall where the hole will be. Drill a pilot hole first using a very long masonry bit (I use a 15mm bit about 3 ft. long attached to an SDS drill – Silverline, at the time of writing, do a set of three super-long long masonry-bits for under £25). To ensure you are at 45 degrees use a longish spirit level with the 45 degree facility (ideally a friend holds the spirit level close to your drill bit whilst you are drilling). Once you have your hole you can just follow it with an SDS breaker with hammer chisel function. A is a length of vitreous flue pipe set to approx. 500mm. B is twin wall (adjustable length in this pic). C is a vitreous elbow with soot door (soot door not required if one can sweep through the stove). 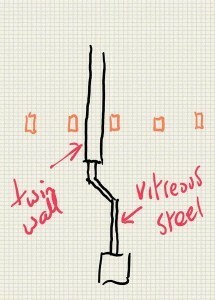 D is a “twin wall to vitreous adaptor”. E is a rosette that is glued to the wall. Best practice is that the stove must not bear the full weight of the chimney (in this case the weight will be downward, outside the property, onto a base support bracket). Steel vitreous pipe is secured together using small self tappers to ensure a firm pipe (happiness is a firm pipe…) and you can lightly spray any unsightly screw heads with black stove paint (mask off pipe first if pipe has a “vinyl sheen” as stove spray is matt-black or you can quickly spray all the pipe matt-black as does a stovefitter mate of mine). If using adjustable pipe (can look a little “functional” though). Secured with a clamp-like ring or with one self-tapper around the back. In the majority of installs the section through the wall will be an adjustable section. 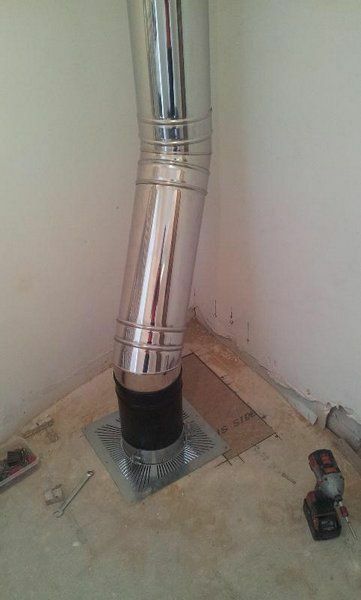 Before you slide your expensive bit of twin wall flue through your wall you may want to insert a metal wall-sleeve (available from Stove Fitter’s Warehouse of course) within the cavity. 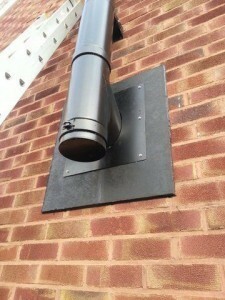 This protects the property from the twin wall flue but also prevents jagged brickwork scratching the flue pipe. Any gaps around the sleeve can be filled with mortar. 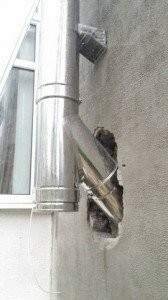 Note that most fitters do not use a sleeve but just push the pipe through and fill the gap with a mortar/vermiculite mix (just stating fact). I do not always mortar the gap around the pipe at the end of the job but fill the gap with Rockwool insulation (available from many merchants but it MUST be Rockwool brand as other brands are not fireproof). I hear that most stovefitters just slap mortar all around the pipe at the end of the job (some add Vermiculite beads to lighten the mix). If you do not use a metal wall sleeve make sure you protect your pipe by putting strong cardboard or something similar in the hole whilst “playing around” with your pipe. If you do not do this your pipe, especially if black, will be scratched and your partner will say you are a muppet. Above is the industry standard method of doing things. I use Thunderbolts to secure the Base Support Unit and other brackets. The offset to clear the eaves may or may not be required depending on the severity of your eaves. Note: I designed and fitted my own adjustable bracket to add support to this installation. The two elbows at eaves height are 45 degrees (15 degree and 30 degree elbows are also available) and we have a short length (250mm) of twin wall pipe between them due to the depth of these eaves. Note that I could also have used a 500mm or even a 1000mm between the two elbows. 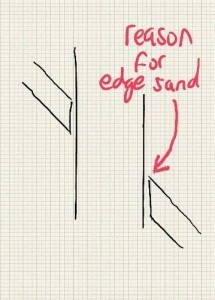 One can then just twist the bottom elbow to bring the upper vertical section back to close to the eaves (looking at the house end on you would then see a dog leg to the right (or left if you twist the other way). In effect you have a dog leg to clear the eaves AND a dog leg left or right. If you understand the hell what I’m burbling on about you will see that, as long as your offset is longer rather than shorter, it is hard to go wrong when striving to clear the eaves as “a little bit of a twist” will sort it out. The exterior rosette is made by myself (easy job if you have a pattern for the elipse) from 12mm Hardiebacker concrete board. I used my interior rosette (purchased from the twin wall flue company) to draw the oval for the hole (using the grinder to make the hole). I also made it in two halves. Cover plates/rosettes are available for most situations. Use Decorator’s Caulking to fill in gaps in joins or countersunk screw heads – and everything looks better when it is painted. The Hardiebacker board is connected to the wall using Thunderbolts. This job was not quite textbook due to the flue height of ensuring that there was going to be a lot of unsupported flue waving around, unsupported, in the air. I spoke to the flue manufacturers for this flue brand (not the brand I now supply as this can go 2 metres) and they informed me that the flue could be unsupported by up to 1.5m only. 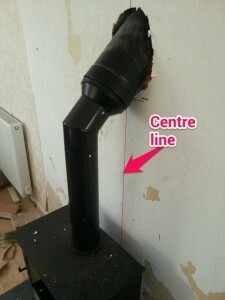 Note: Some twin wall flue can be unsupported up to 2 metres. I have installations with 2.5m of freestanding flue but I would not wish to go to more than this. If 1.5m or more unsupported I add some chunky self-tapping roofing screws (drill 4mm pilot hole and then use a battery driver to drive these in). This adds a load of extra security. 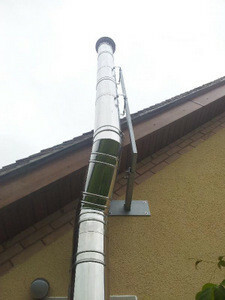 An adjustable bracket (flue can be between x and y cm from the wall). Various sizes available. So back to our job… because of the unsupported flue my colleague and I fashioned an adjustable support bracket in his workshop, making sure it was also strong enough to take the weight of the chimney above it and provide lateral stability. We painted this bracket with a primer and silver Hammerite. What’s the 45 degree T with cap for? This is where the sweep inserts his brushes to sweep the bulk of the chimney. He will also do some sweeping inside but it is good to get the majority done outside the building. Mucky pups some of these sweeps. Note that there is no base support unit in my job above. Some fitters do not fit them (to save money). I used to be the same. Then I ran into problems with one job where I used “long adjustable brackets” as the flue needed to be “away from the wall” by quite a lot. As I progressed skywards the brackets started to sag. Lesson learned. Do it once, do it good. Note that the Duraflue “Vitreous to twin wall adaptor” that Stovefitter’s now sell is different to the one one pictured (picture is from a past install). 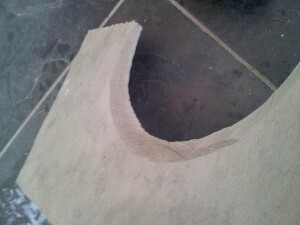 Hearth bedded down with clear silicone (although now I would use a thin layer of carpet or underlay). Hardiebacker board in two parts sprayed black with stove spray. Not quite finished… I will return and fit a one metre to the top rather than a half metre as I misunderestimated and am a little short (at or within 60cm of the ridge one has to be 60cm above the ridge). You can see the brackets on this picture. You can also see the black roofing sealant we used to seal around the Hardiebacker board and in the gap between the 2 pieces. NOTE: Once again in the job above I have not fitted a base support unit. 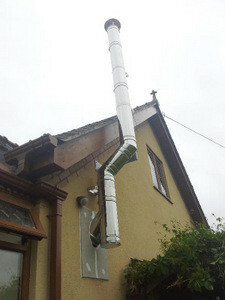 With short brackets (flue close to wall) one can get away without it. However I throughly recommend fitting a base support unit as it adds foundation strength to the chimney and prevents other brackets “sagging” (I learned from my mistakes so you do not have to). As I said earlier the base support unit can be fitted to ANY VERTICAL JOINT. This is a brand called Midtherm. Brands all do things slightly differently but the essentials are similar. Obviously your joists might not be conveniently spaced for the support plate and Fire Stop Plate. In such a case you will add one or more “noggins” (extra pieces of wood) where required. Radiation shield not required is just an optional extra. 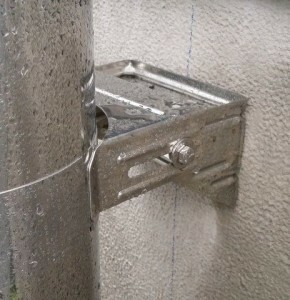 The twin wall flue is prevented from “dropping through the hole” by the clamp. I believe that the graphics above explain everything very well. The twin wall flue can be black or silver. Note that it is considered good practice that the first vertical length of pipe from the stove must not have any bends in for the first 600mm whether the pipe exits the stove from the rear or top. Above are just a few examples of the routes you might take. In your mind at all times will be the Building Regulations (especially “no more than four bends”and your termination point and the 2.3m rule (this rule is to do with outside the building): Regulations For the Chimney). Another key issue is the gaps between your joists and the gaps between your roof rafters (twin wall flue requires a safety air gap – usually 5,6 or 7cm depending on brand). 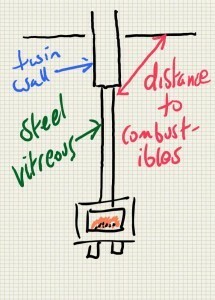 If these are close together consider a stove that is allowed to have a 5″ twin wall flue (external 7″ due to insulation). 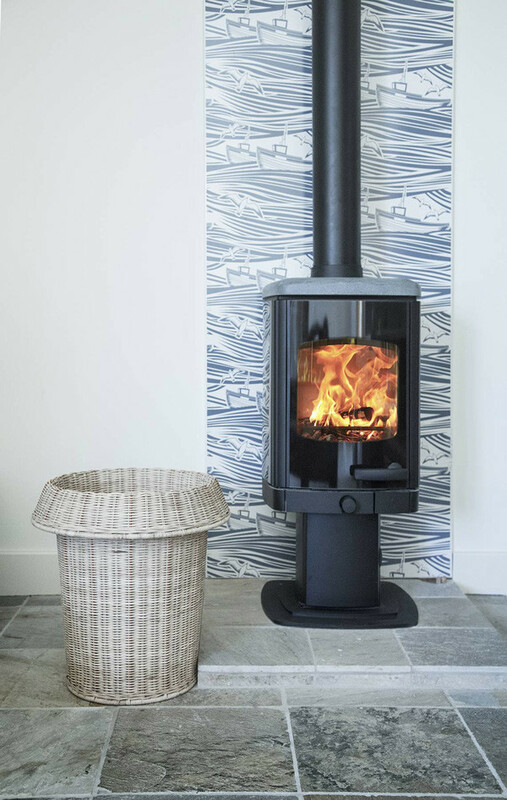 See Defra-approved stoves articles as only DEFRA-approved stoves can use 5″ flues. The starting point for you stove will likely be determined by ceiling joists. 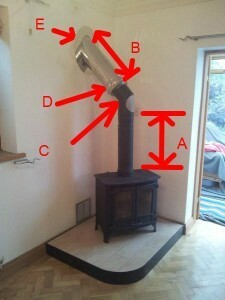 Above scenario means two bends used so might be best to move stove to left so can have straight flue. 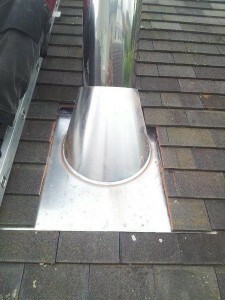 The ceiling above your stove is probably the easiest place to start when designing your chimney: you can position your stove directly beneath the gap between two joists if this works for you – or you can use elbows to offset your stove (the problem here is that you will use two of your four bends rationing). If you have two ceilings to pass through then you will likely want to position your stove directly underneath the gap between the lower ceiling joists. 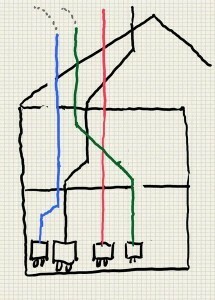 This means that you have four bends in the bank: two bends for aligning to get through the second ceiling, and two more bends available to you should you need an offset in the attic to align the route through the gap in the roof rafters (the black line in our graphic above: flue routes). When creating offsets using elbows you can vary the offset with 15, 30 and 45 degree offsets provide differing offset amounts. You can also add sections between the elbows if required (25/50/100cm lengths available). 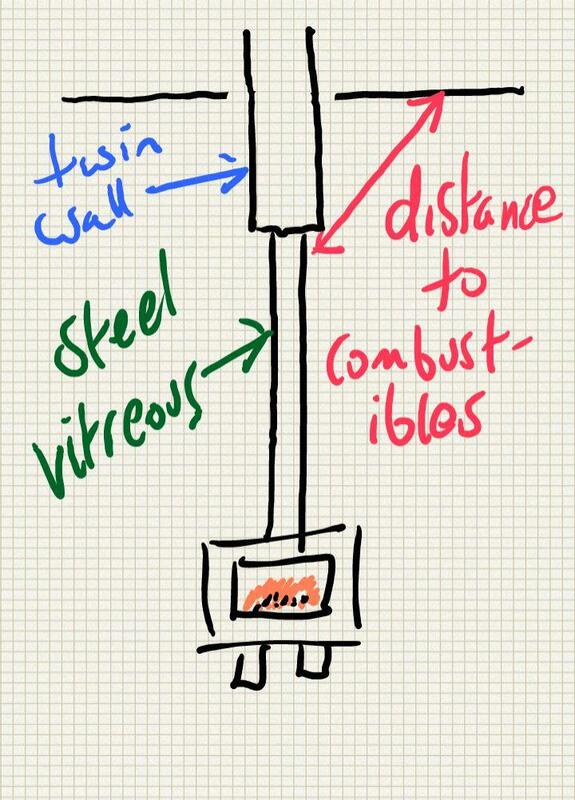 IMPORTANT NOTE: Although your twin wall pipe can be as close as 5cm to combustibles (some brands 6cm or 7cm) your steel vitreous pipe, coming off of the stove, has to be a long way away from combustibles (3x its own diameter – so 15″ for a 5″ pipe and 18″ for a 6″ pipe). Also your stove has to be a long way from combustibles (often 24″ or more see stove installation manual or stove brochure). Plasterboard walls are classed as combustible in Building Regulations (although some Building Control Inspectors seem to use common sense and treat it as non-combustible so you could ask whoever is signing off for their advice). See distance to combustibles. You may wish to take your twin wall pipe all the way to the stove if you are having problems in this area (twin wall can look very big and fat on smaller stoves though – not such a problem if 5″ internal is used as outer diameter is 7″). Update June 2016: A company called Vlaze have just launched “aesthetically lovely” but bloody expensive heat shields that sit behind the stove see pic below. Call Stovefitter’s for more details. You can also make a similar heat shield from 12mm Hardiebacker board (buy in 1.2m x 0.8m sheets) then paint it with emulsion (same colour as wall or different, your call). If you do follow this route you will need an air gap between the back of the Hardiebacker and the wall – of at least 12mm (use 12mm spacers close to the corners of the Hardiebacker). I use 12mm copper plumbing-pipe sections as spacers and Thunderbolts. Countersink the Thunderbolt heads then fill countersink hole with Decorator’s Caulking). Check with whoever is signing the stove off if they are happy with this but it should allow you to reduce stated clearances to half that stated (based on shield information provided in Doc J of the building regulations). Or, if whoever is signing off the stove is happy, you can tile onto the Hardiebacker (search for “tiling behind wood stove” in Google images for ideas). If one were very naughty one could of course tile straight onto the plasterboard as nobody knows what is behind the tiles anyway – plasterboard with tiles on top is completely safe it’s just that plasterboard is not classed as A1 fireproof. Please do think about hidden wooden battens behind the plasterboard if a stud wall as these are classed as combustibles. For travelling through floors you will find that your chosen brand of twin wall flue will have proprietory and certified parts e.g. “firestop support set” to a) seal pipe against ceiling and b) some kind of support to connect the pipe to the floor above (or top of joists). Don’t fret about this as these items are usually very easy to fit. 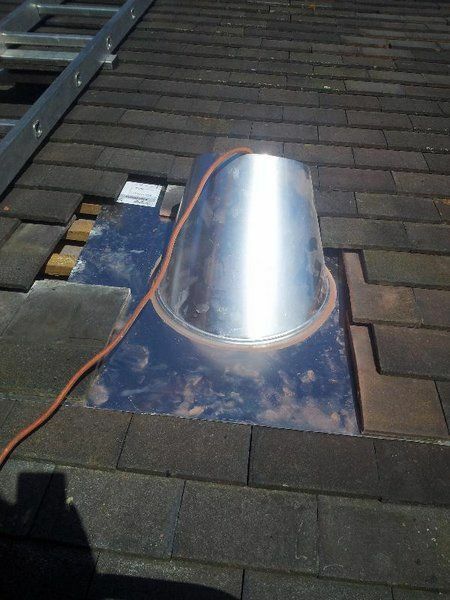 Going out through the roof is often more straightforward than it sounds and the only difficult bit is fitting the roof flashing (the item the flue passes through). 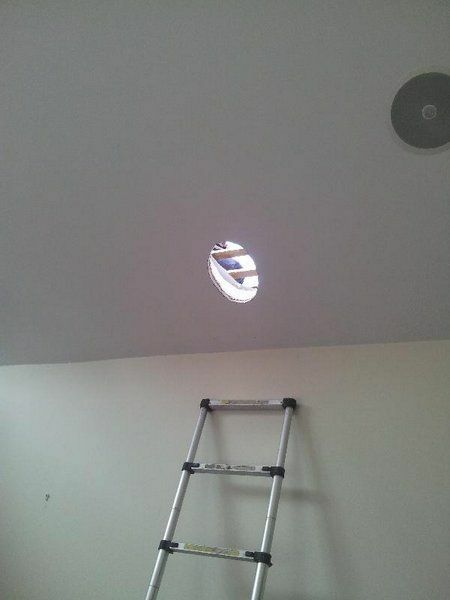 This is where you might choose to employ a roofer (I have used a roofer in the past and paid £120 for him to fit the roof flashing that is required, not including the cost of the flashing unit). If you are happy with a bit of roofing then you might wish to do it yourself. The image above is missing a Rafter support (sometimes known as “roof support”) and this holds the pipe in position between two rafters. You will need to add a bead of Silicon to prevent water sneaking between your Storm Collar and your flue pipe (normal Silicon fine, do not worry about heat). Various roof flashings are available. 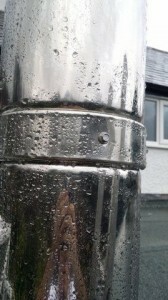 Some leave an air gap around the flue pipe and rely on the storm collar to prevent water ingress. Others have a high temperature rubber seal. 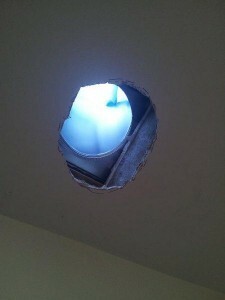 Hole made with plasterboard saw. Aluminium roof flashing (that does not seal around the flue pipe). 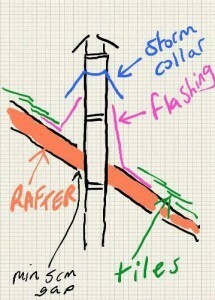 How to aesthetically seal the flue inside the building at the rafters on a vaulted ceiling if the brand used does not offer a suitable rosette? You should be able to still fit a rafter support and hide it with a cover plate. Cover plates can be purchased, or you can make one yourself with Hardiebacker board (6mm or 12mm thickness) as shown below. 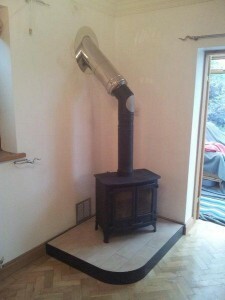 The chimney is supported by a base support unit and it is this taking the weight. I know it’s rather utilitarian! Leave it on show or box it in. Boxing in actually looks fine but needs a bit of joinery and plasterboarding. Please ensure you understand the Building Regulations with regards to distance to combustibles. The ceiling of a property is invariably classed as combustible. That’s why the twin wall flue pipe in our picture protrudes so far into the room from above – to keep the steel vitreous pipe away from the ceiling (42.5cm is enough protruding to keep 5″ and 6″ diameter vitreous far enough away from the ceiling for Building Regs). If you have a plasterboard wall (classed as combustible according to Hetas) you will also need to ensure your vitreous pipe is far enough from that wall (this protection documented in distance to combustibles). Regulations for solid fuel can be found in (Document J of the Building Regulations). You may also wish to refresh your knowledge of: distance to combustibles. 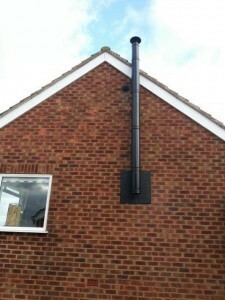 You only have to box in your twin wall flue if it is passing through a storage area or a loft. You can use stud wall (wood frame and plasterboard) as long as your minimum Xcm clearance is adhered to (usually 5cm or 6cm). In lofts you can use a cheap and cheerful wooden frame with chicken wire (to prevent storage items falling onto the flue). 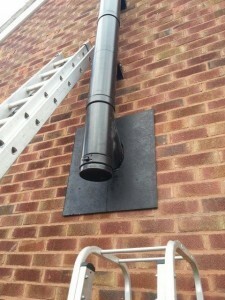 Here’s a picture of a flue boxed in (ensuring a minimum 5cm clearance from the pipe). Note that you are supposed to have 30cm square access hatches within 1.5m of each joint according to Building Regulations (must be hidden in the pic below ;-).